All Comments to Kelly's Photos | Fotki.com, photo and video sharing made easy. I would love to give it to you! Please get me your email address and I will send you a copy! You should be very proud!! And completely understand being scared when they go out of sight as I have a husband, two sons and a daughter who ride plus extended family and friends...too many heads to keep track of! Email me at info@wyantracing.com and I'll send you this shot! great pic of Jordon Potter. These are not posted on Facebook, so I cannot tag you. Check your email! Thanks for asking! The Friday photos are still uploading. There will also be photos from Sat. and Sun. uploading soon. 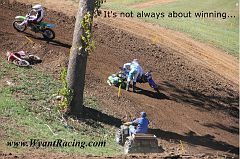 I cannot always get every moto as I have 4 riders in my immediate family that I also have to help prep bikes and gear. Nice photos of Looking Glass Falls. I lived about 30 minutes from there from 1999-2007. I spent a lot of time in Pisgah Forest, and never get tired of photographing the falls. This car passed us on our way home thru the mountains on the TN/NC state line. Those are SURF BOARDS on top...the last thing we expected to see on our way home, but sure brought back some good memories!